WASHINGTON ? Donald Trump Jr. told Senate investigators on Thursday that he set up?a June 2016 meeting with a Russian lawyer?because he was intrigued that she might have damaging information about Hillary Clinton, saying it was important to learn about Mrs. Clinton?s ?fitness? to be president. But nothing came of the Trump Tower meeting, he said, and he was adamant that he never colluded with the Russian government?s campaign to disrupt last year?s presidential election. In a prepared statement during an interview with Senate Judiciary Committee investigators, the younger Mr. Trump said he was initially conflicted when he heard that the lawyer, Natalia Veselnitskaya, might have damaging information about Mrs. Clinton. Despite his interest, he said, he always intended to consult with his own lawyers about the propriety of using any information that Ms. Veselnitskaya, who has ties to the Kremlin, gave him at the meeting. A copy of Mr. Trump?s statement was obtained by The New York Times. The acknowledgment by the president?s eldest son that he intended to seek legal counsel after the meeting suggests that he knew, or at least suspected, that accepting potentially damaging information about a rival campaign from a foreign country raised thorny legal issues. ?To the extent they had information concerning the fitness, character or qualifications of a presidential candidate, I believed that I should at least hear them out,? he said. ?Depending on what, if any, information they had, I could then consult with counsel to make an informed decision as to whether to give it further consideration.? 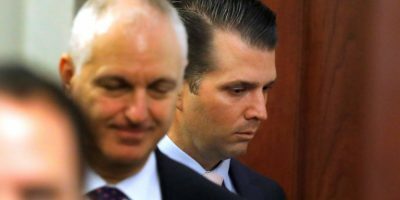 The June 2016 meeting came about after the younger Mr. Trump received an email from a family associate saying that potentially damaging information was being provided as part of the Russian government?s support for his father. But in his statement on Thursday, he described his decision to agree to the meeting as the byproduct of the chaotic, seat-of-the pants campaign assembled by his father, rather than any attempt to collude with Russia. Mr. Trump has given differing accounts of his contacts last year with Russians. He told the Times in March that he never met with Russians on behalf of the campaign, a statement his lawyer has since said was meant to refer to Russian government officials. In July, he described the Trump Tower meeting as primarily focused on the issue of Russian adoptions, before eventually acknowledging that he took the meeting because he was told Ms. Veselnitskaya had damaging information about Mrs. Clinton. But intentionally misspeaking to Congress is a crime, giving his statement on Thursday added weight. He told investigators that working for his father?s campaign consumed his life. ?I had never worked on a campaign before and it was an exhausting, all-encompassing, life-changing experience. Every single day I fielded dozens, if not hundreds, of emails and phone calls.? He is the second person connected to the Trump campaign to tell congressional investigators that the campaign was, essentially, too inexperienced and too unfamiliar with politics to pull off a master strategy ? let alone coordinate with the Russian government. Mr. Trump?s brother-in-law, Jared Kushner, painted a similar picture during an interview with the Senate Intelligence Committee. In his statement, Mr. Trump said he had some reservations about the June 2016 proposal from the meeting?s facilitator, Rob Goldstone, whom he described as a ?colorful? music promoter he had come to know through the son of a Russian oligarch. Mr. Goldstone asked Mr. Trump to take a meeting that would include potentially damaging information about Mrs. Clinton. ?Since I had no additional information to validate what Rob was saying, I did not quite know what to make of his email. I had no way to gauge the reliability, credibility or accuracy of any of the things he was saying,? he said. ?As it later turned out, my skepticism was justified. The meeting provided no meaningful information and turned out not to be about what had been represented.? In an email response to Mr. Goldstone, Mr. Trump wrote that if the promised information about Mrs. Clinton was as advertised, ?I love it.? ?As much as some have made of my using the phrase ?I love it,? it was simply a colloquial way of saying that I appreciated Rob?s gesture,? he said in his statement on Thursday. The Senate Judiciary Committee is one of three congressional panels investigating aspects of Mr. Trump?s ties to Russia and related matters. The committee, which has oversight of the Justice Department, is particularly interested in the circumstances surrounding Mr. Trump?s abrupt firing in May of James B. Comey as F.B.I. director. Mr. Trump was still being interviewed by midafternoon, as Democratic and Republican staffers took turns questions Mr. Trump in one-hour blocks. Senator Richard Blumenthal, Democrat of Connecticut, said the mood behind closed doors was ?cordial? and that investigators were asking primarily factual questions. He said that what he had heard so far only made him more certain that the committee needed to hear from other attendees of the Trump Tower meeting, including Mr. Kushner and Paul J. Manafort, who was the Trump campaign chairman at the time. Senator Blumenthal said that the committee needs to look further into how Mr. Trump?s initial statements to the press about that meeting were put together. ?We covered a good deal of ground,? Mr. Blumenthal said. ?There is still a lot of questioning to be covered. ?